My Manicure Monday today is kind of an experiment. 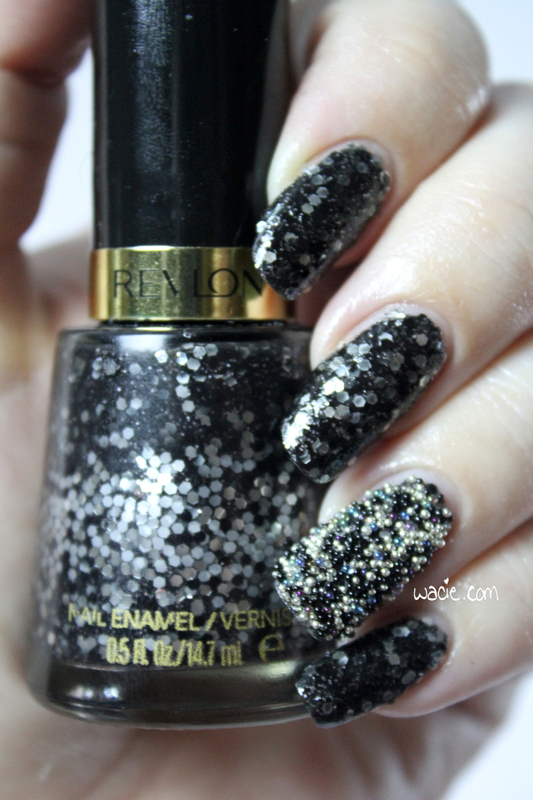 The polish I have on is one I love, Revlon’s Sparkle Aplenty. I needed an accent piece, so I tried caviar nails for the first time. I’m wearing three coats of Sparkle Aplenty with one coat of Ciate’s Speed Coat Pro, and my caviar mix is Ciate’s Midnight in Manhattan. 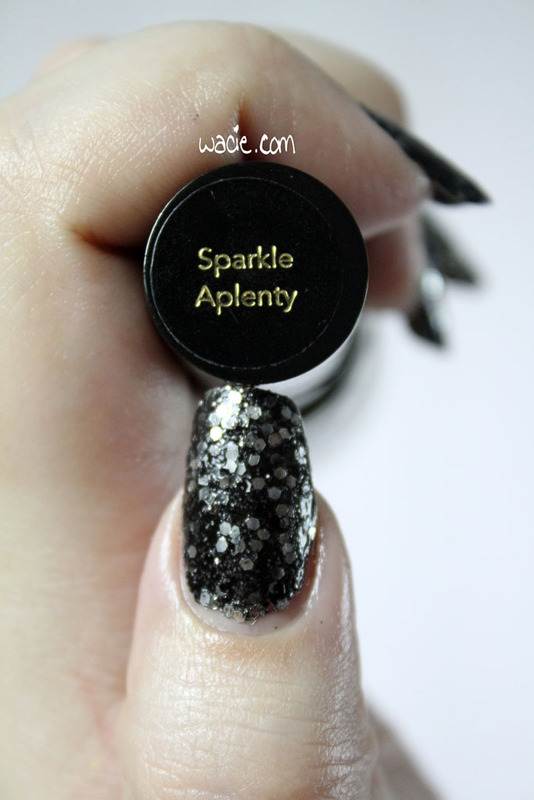 Sparkle Aplenty is a black crelly with lots of metallic silver glitters in various sizes. It went on pretty easily; the first coat was thin and streaky, but the second one evened it out nicely. Full opacity was reached at two coats. The glitters spread well and evenly. This polish dries quickly and with a satin/semi-glossy finish. Because glitter is the bulk of the polish, there’s lots of glitter texture after drying; a top coat would definitely be necessary with this. I thought the Midnight in Manhattan would be the perfect caviar mix, because they contain the same colors. The caviar beads are actually a bit more colorful; in my office, it just looks like silver and black beads. In the studio, I find out that they’re gold, as well as some greens, blues, and purples that I failed to notice before. Also, for some strange reason, the corners of my caviar nail appear to flare out instead of curling under, like the rest of my nails do. It looks weird when all my nails appear slender and tapered, and then one looks like a duck foot. It bothers me. It’s wrong. 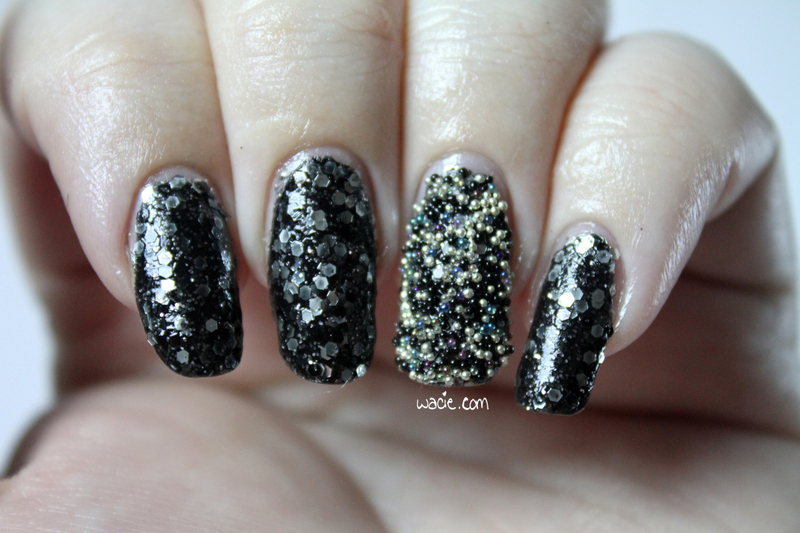 I do admit I liked this mani a lot better before I added the caviar. I should have just used studs again. 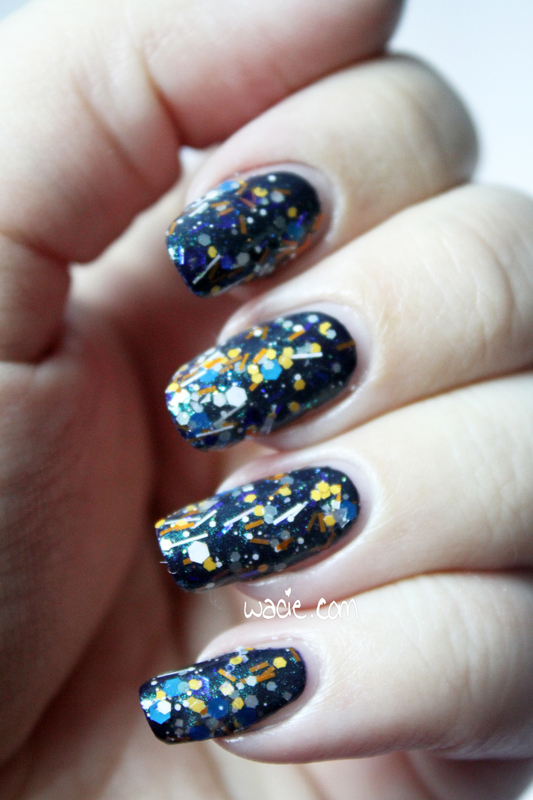 I don’t hate caviar nails (yet), but I have a ton of bead jars (thanks, Ciate advent calendars), and I wanted to use one, just to see what the two-year-old fuss was about. Perhaps I’ll like them more in the future. Today, I don’t. Today, I just see fail. 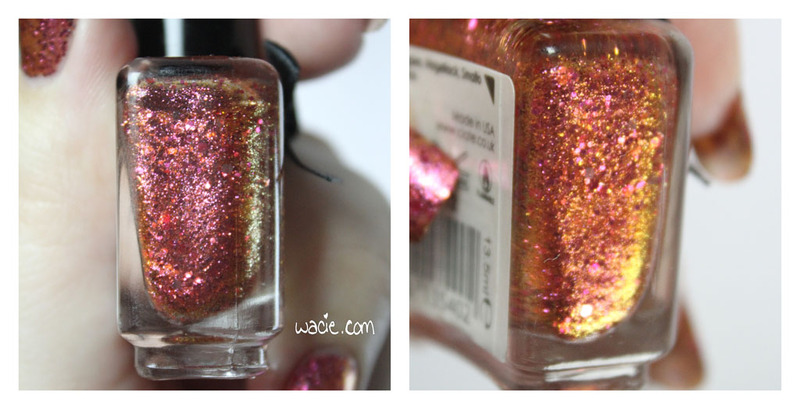 For this edition of Swatch Sunday, I am bringing you a super oldie. This is a polish I’ve had since about 2008, and I almost thought this would be this bottle’s last mani. 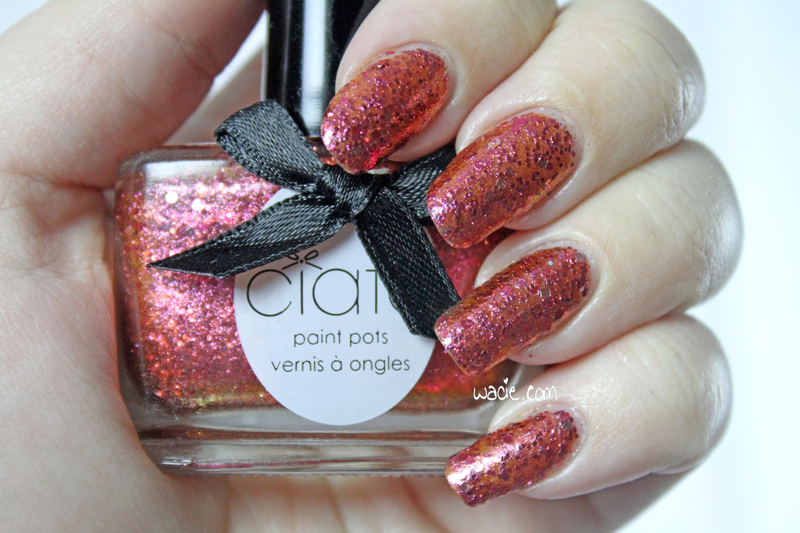 This is a mystery polish from Claire’s; there’s no indicator of the shade name anywhere. 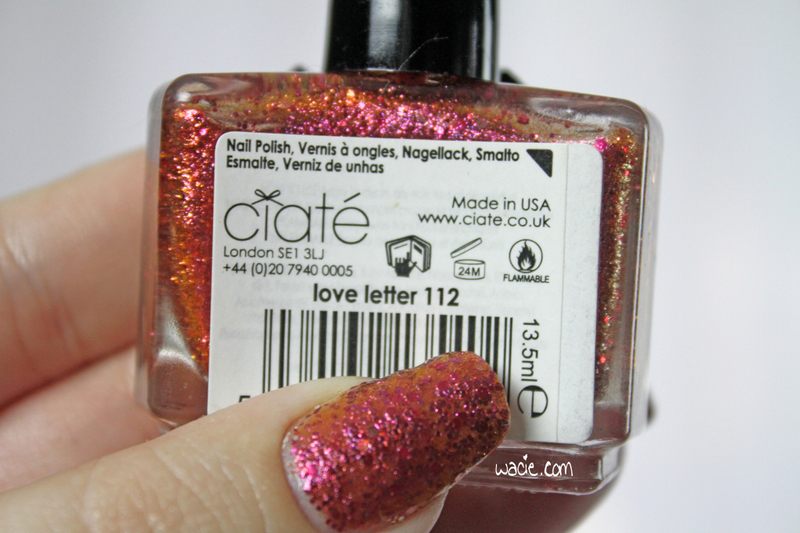 I’m wearing this at three coats with one coat of Ciate’s Speed Coat Pro top coat. 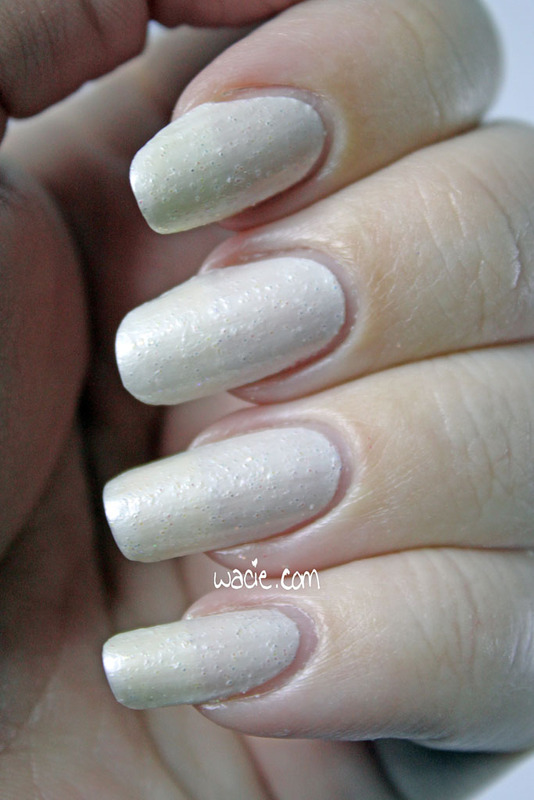 This mystery polish is a milky and frosty white with small iridescent glitters. Before I put this on, it was thick and goopy. I might have put too much thinner in it, because the application was quite streaky, and three coats was still pretty sheer. The white pigment is very chalky and dries matte, which doesn’t do any favors for the glitter. 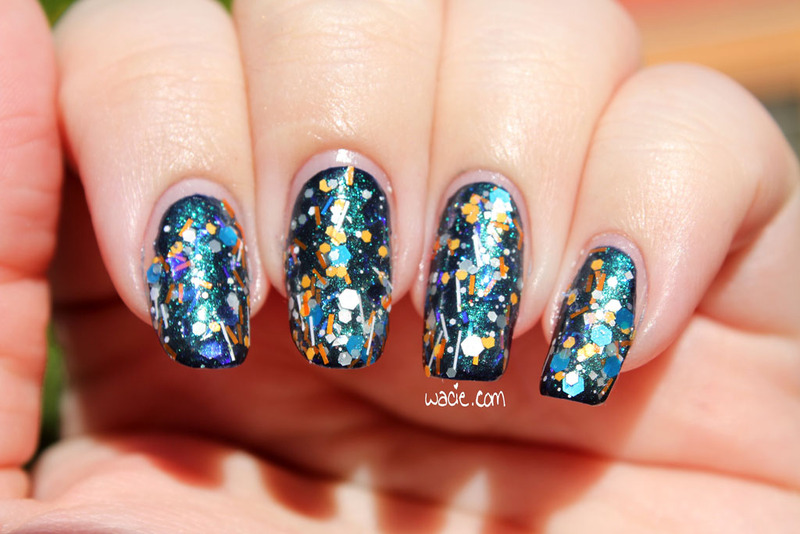 The finish is gritty and the glitter is covered up, leaving it to look like chunks and bubbles in the finished look. It’s not ideal, and probably wasn’t intended. This polish did dry quickly, so it has that going for it, which is nice. Like I said, I’ve had this bottle for many years. It’s one of the oldest bottles in my collection. 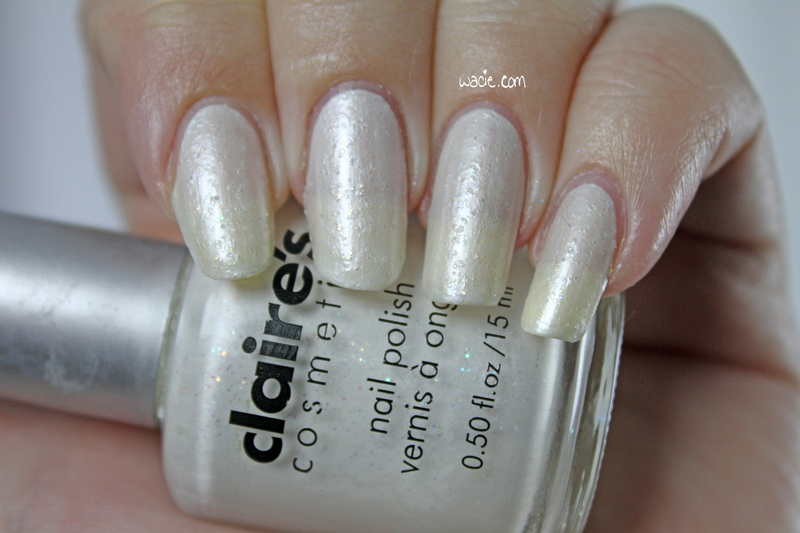 I remember I grabbed it because I just wanted a white polish, and this was the first one I saw. This wasn’t long after I’d finally stopped biting my nails, and is one of the first bottles of polish I owned as an adult. Even though the polish itself is kind of sucky, I’ll be sad when this runs out, just because I’ve had it forever. It’s like one of my oldest children. When it’s finally gone, it will be kind of sad. I might even feel the need to recreate it in the future. If anyone reading this happens to know the same of the shade, I’d love to know what it is! It’s Swatch Saturday again! 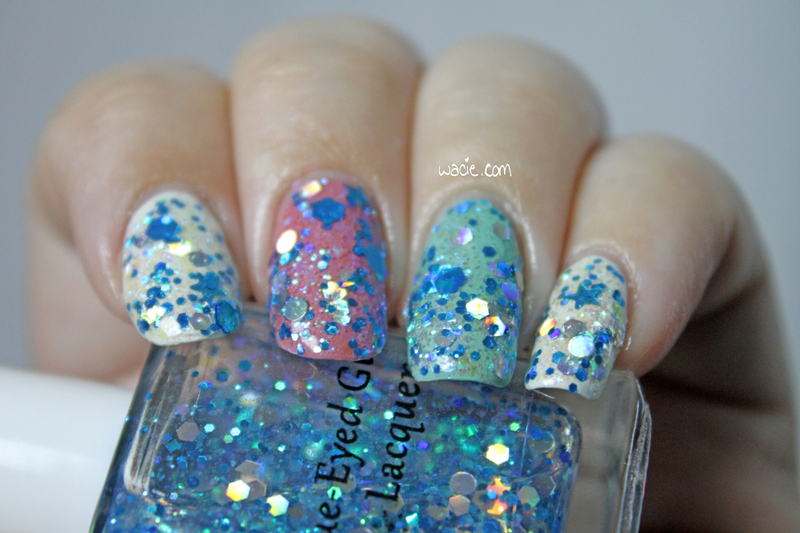 Today, I’m bringing you the second part of Blue-Eyed Girl Lacquer‘s new year’s duo. Released early this year, 2014 and Resolutions were released alongside their winter collection. We saw 2014 last week, so today we’re looking at Resolutions. I’m wearing one light coat of Resolutions over Sally Hansen’s Hard to Get, Julep’s Martha, and China Glaze’s Pelican Gray, as well as one coat of Ciate’s Speed Coat Pro top coat. 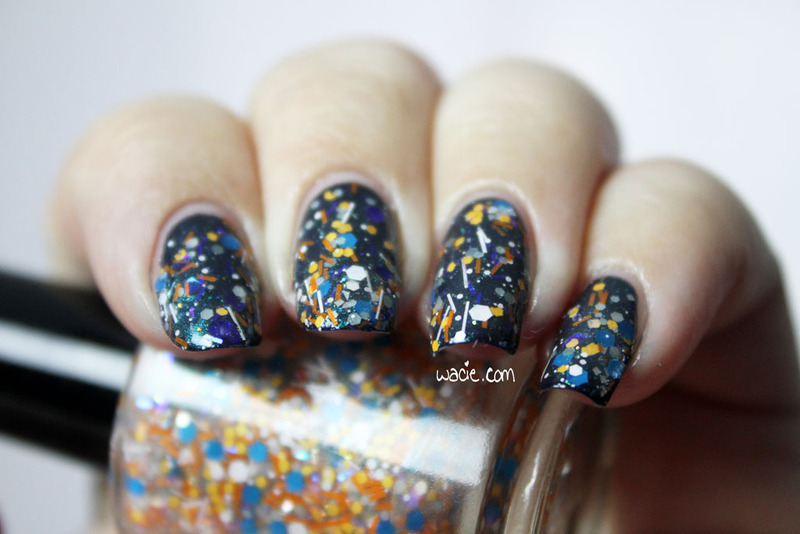 Resolutions is a glitter topper with primarily black and blue dots and hexes, as well as icy blue shimmer. There are a few colorful surprises: lime green diamonds, white blocks, black stars, purples, yellows, corals. I put on a very light coat, and I didn’t get a lot of the big colorful glitters. They’re kind of hard to fish out, and tend to hang out at the bottom of the bottle. A second coat would definitely have helped me out, and probably would have helped me get those big pink dots and hexes. Those are my favorites. As always, this is a dream to wear and apply. I could have used a little more glitter on the brush, but that’s not too much of a worry. 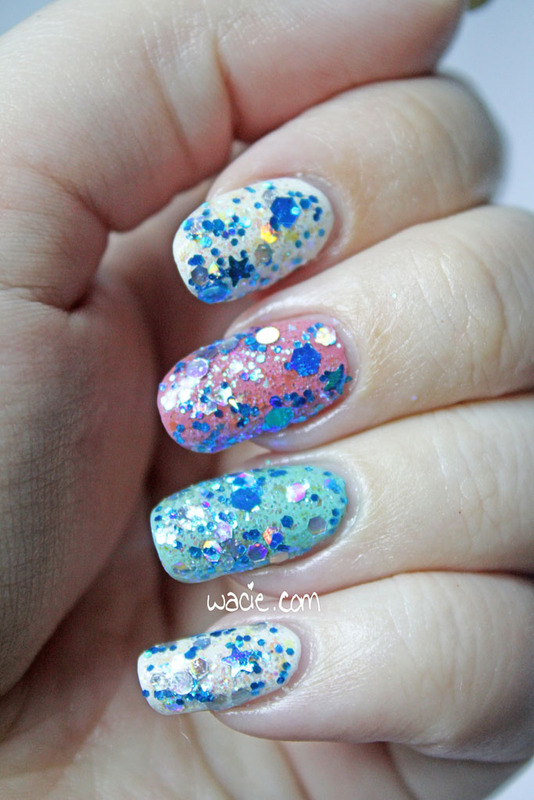 The base dries fast, and surprisingly, the glitter is flat and smooth on the nail, which rarely happens with polishes like this. Even the big glitters are glassy smooth. It’s nice. Unfortunately, this is long discontinued, but a few of my favoritest BEGL glitter toppers are actually on sale in the BEGL store. If you liked this one, I think you’ll love those. 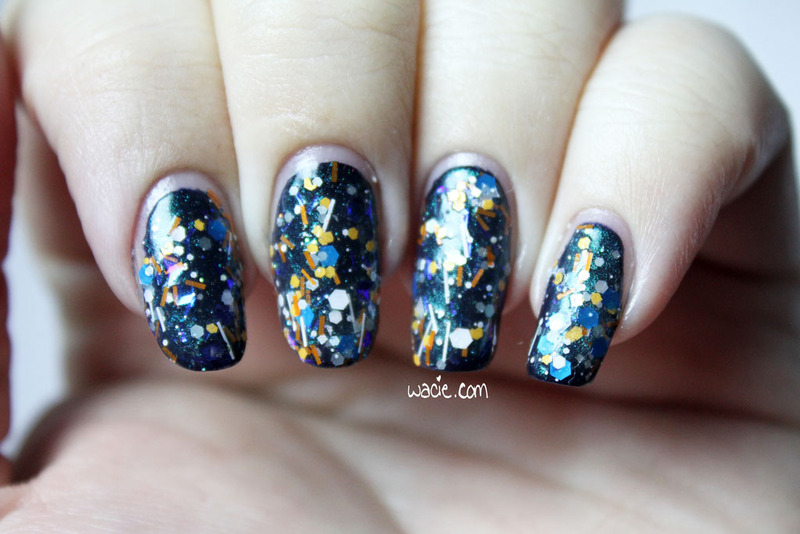 Manicure Monday: What Wizardry is This? What’s this? A textured polish two weeks in a row? Yes! It’s crazy. This is What Wizardry is This? from OPI; I’m wearing three coats without top coat. What Wizardry is This? 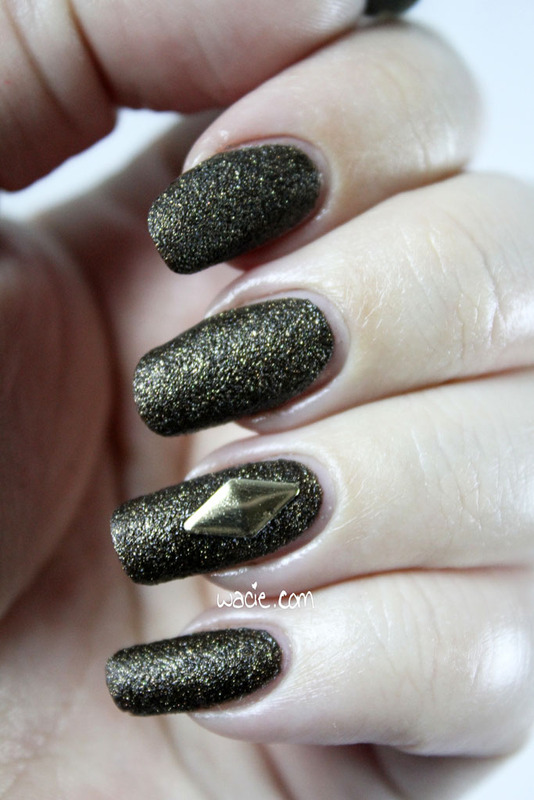 is a warm brown textured polish with gold glitters. I found this application much easier than Solitaire‘s; Solitaire’s brush was spread wide with glitter, and even though this polish also contains a ton of glitter, the brush was not as wide, and I had a much cleaner application. Drying time was very fast, and full coverage was gained in two coats. The glitters are very potent, which is why it looks more brown in some photos and more gold in others. It’s a very pretty and interesting look. I like when I end up wearing something seasonally relevant. Solitaire was wintry and peaceful, but What Wizardry is This? is very warm and autumnal. It’s the color of hot cocoa and firewood. This is absolutely perfect for fall. I don’t have any brown nail charms, so I used a stud. Earlier in the year, I got a huge pack of nail accoutrements at an outlet store for super cheap, and this is the first time I’ve used any of it. Originally, I’d chosen a heart-shaped one, but it wouldn’t sit flat on my nail, so I went with this diamond/Sims plumbob shape instead. I like it. It takes up more of the nail than I wanted, but it’s a fun accent. I wasn’t sure about this at first. When I got it, the Liquid Sand bandwagon was at full speed, and I just wanted all of them. I don’t own very many brown polishes, just because it’s not a very popular color. It’s also not very daring. This is more than just brown, though. It’s gorgeous. 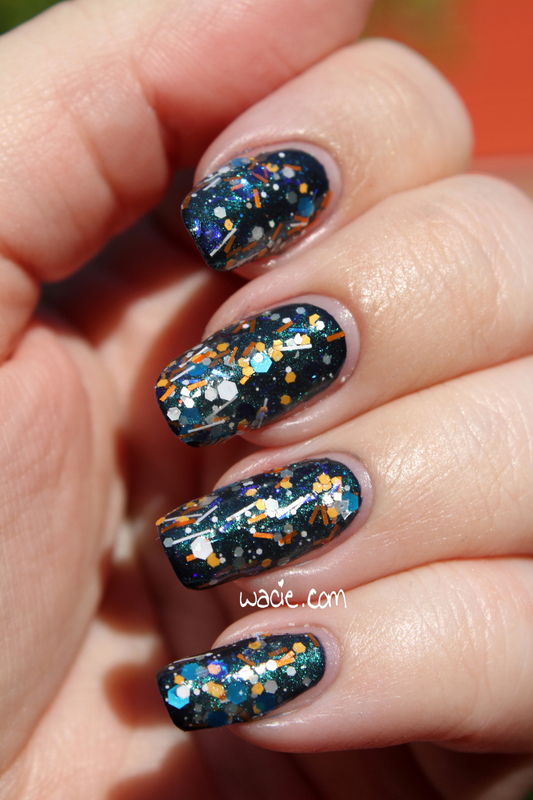 For today’s Swatch Saturday, I’m wearing a polish made to commemorate the new year. Here I am, wearing it in November. 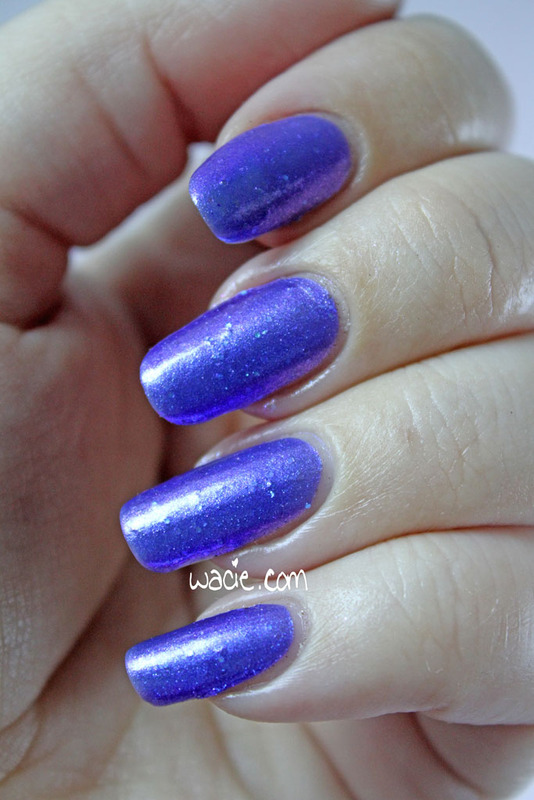 This is Blue-Eyed Girl Lacquer‘s 2014, shown at three coats with one coat of Ciate’s Speed Coat Pro top coat. 2014 is a blurple polish with a blue-to-purple shift and iridescent glitters. The shift here is very strong, and pops out just about everywhere. 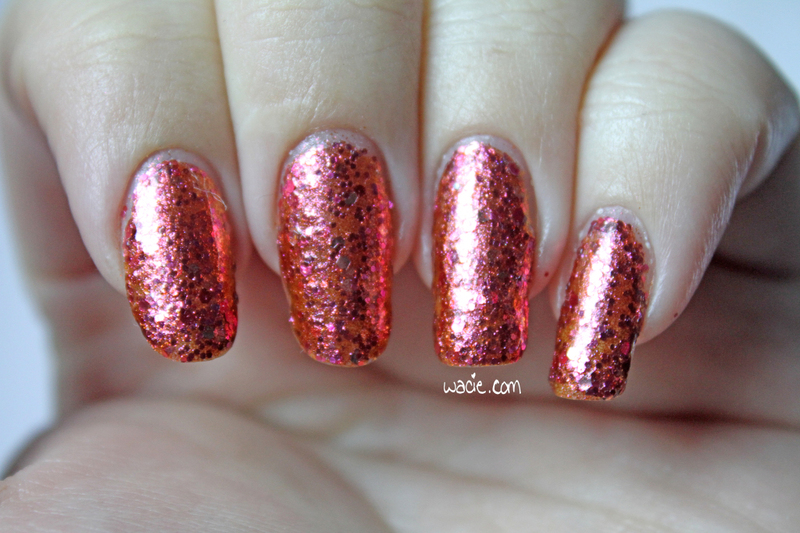 The glitters are scarce, and are probably unnecessary with all the shimmer and shift. I like them in there, but I can take or leave them. 2014 dries with a satin finish, and with a very quick drying time. Consistency was ideal and application was very easy. So let me tell you about this shift. Good lord, this shift. When I say it’s strong, I mean it’s strong, like a stiff drink strong. I can’t stop looking at my nails because they’re a different color every time I look at them. 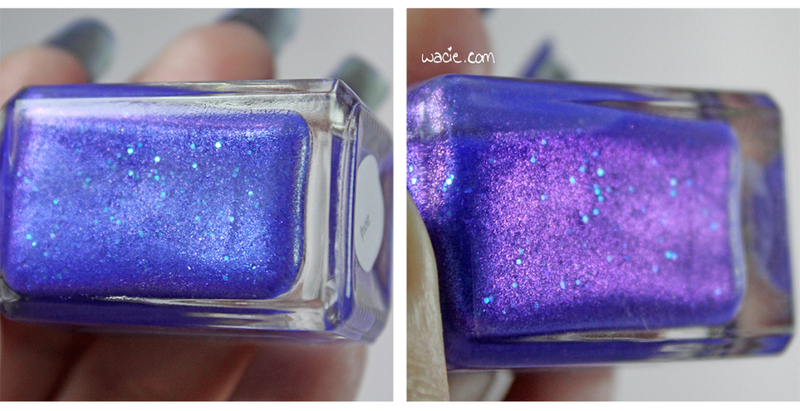 Sometimes they’re emitting this icy blue shimmer, sometimes it’s a vibrant violet. I never know which I’m going to get, but I know it’s always going to be gorgeous. 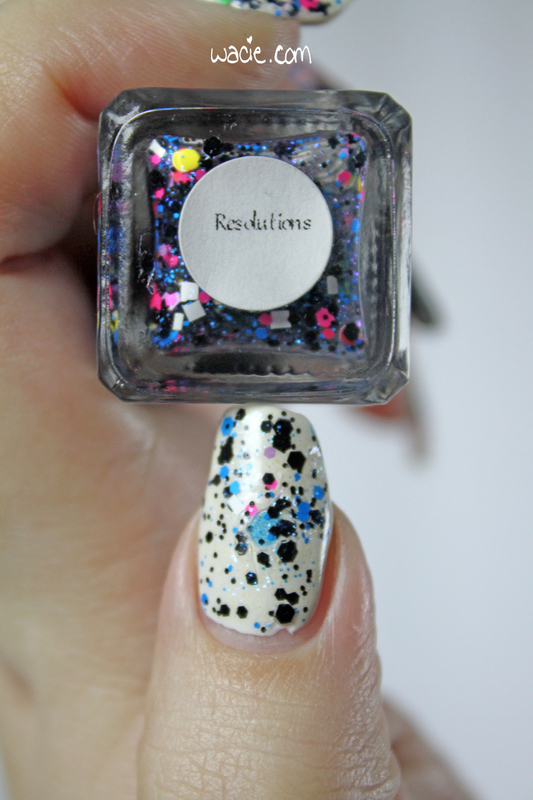 2014 was released on its own, but also had a companion polish called Resolutions that we’ll see next week.Unfortunately, both are discontinued. Keep your eyes peeled in blog sales, though; this isn’t one you want to let slip by again. If you liked 2014, you might like a currently-available BEGL called Just Admiring Your Skills, Sweetie. It’s more purple than blue, but it also has an unbelievable shift. You should grab that one, too. Hey, guys! 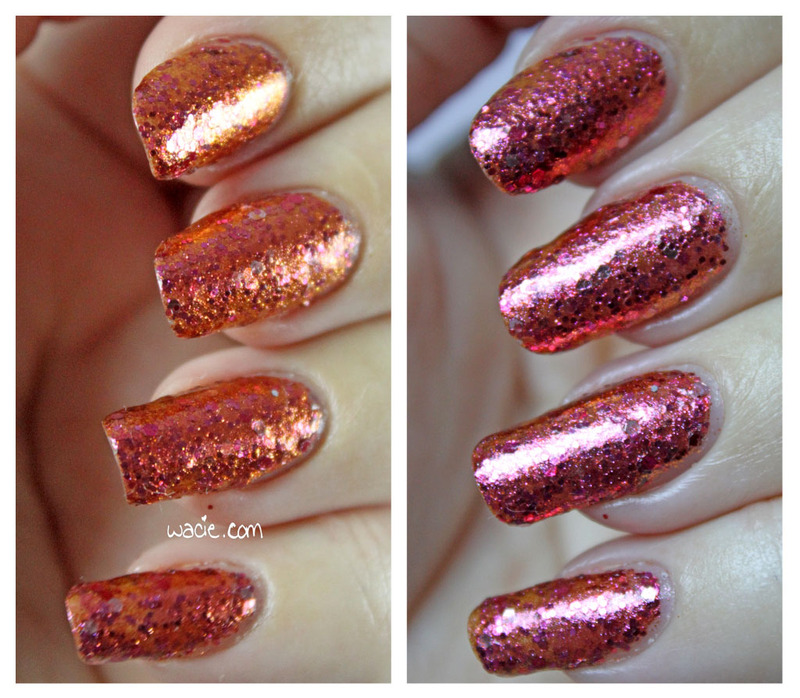 I’m super excited about Manicure Monday this week because I get to wear a textured polish. I’ve only featured one other on the blog, so it feels a little like a special occasion. 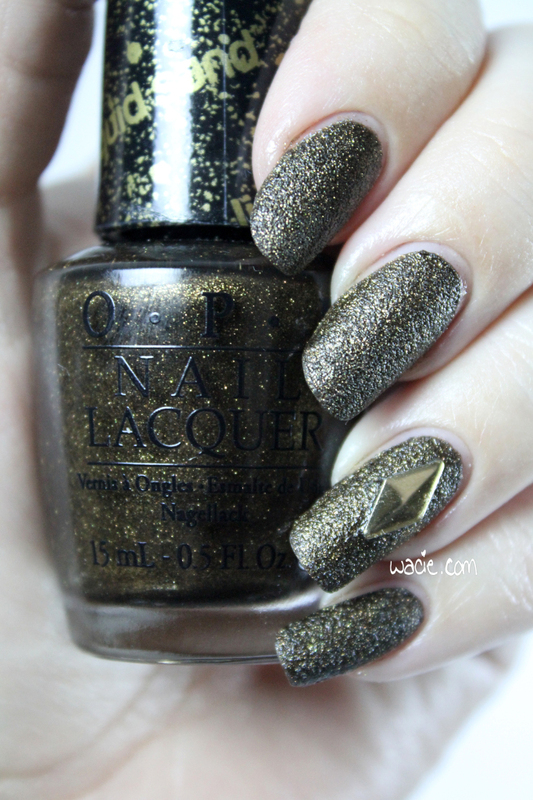 I’m wearing three coats of OPI’s Solitaire without top coat. 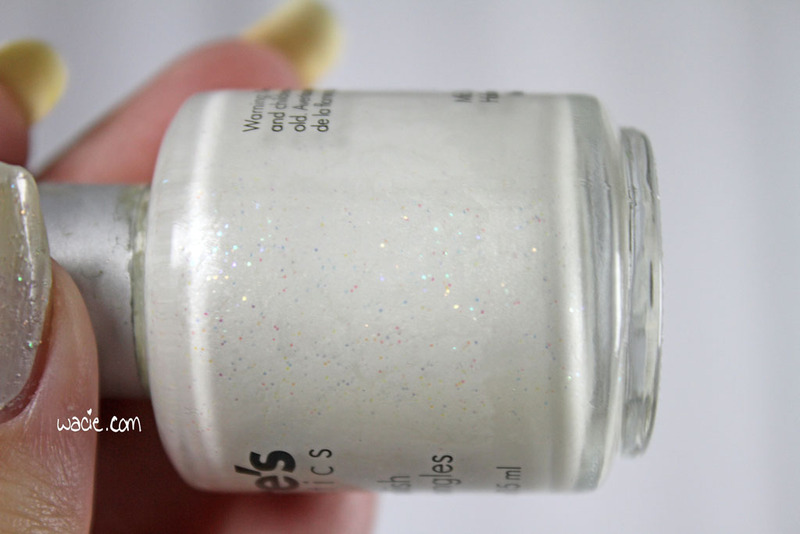 Solitaire is a ton of silver glitter in a sheer white base that dries with a matte texture. It goes on pretty frosty at first, but when the lacquer dries away the frost disappears, leaving behind silvery sparkles. I felt like three coats were necessary with this, because the white base is very sheer, and I wanted full opacity and lots of texture. It dries pretty quickly, since there’s so little lacquer. The consistency is thick, naturally, since there’s so much glitter. Application isn’t too bad, but when the brush has polish in it, it fans out and is wider than some of my nails, and makes a little bit of a mess. It’s so worth it, though! 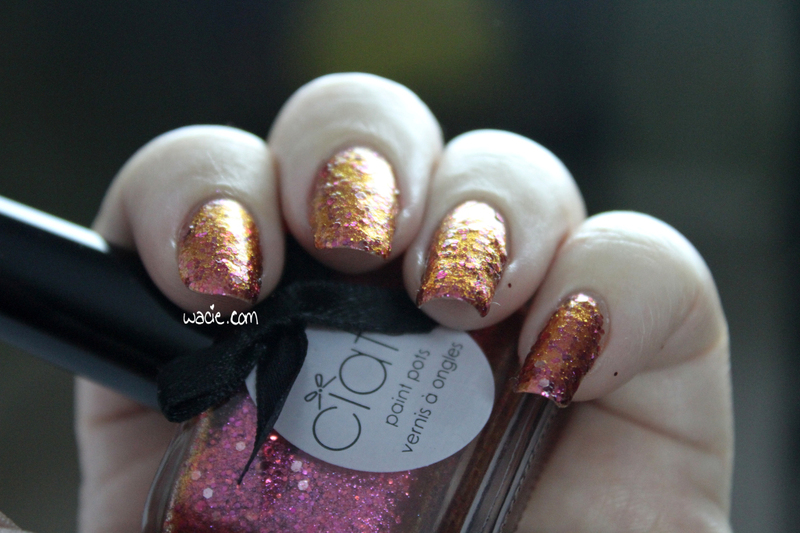 I was a little unsure about this polish at first, because I remember being a teensy bit less-than-impressed with the Bond Girls collection, especially in comparison to Mariah Carey’s collection. It just seemed like the Bond Girls collection focused more on matte texture than glitter, and the glitters were the reason I bought them in the first place. This one is nice, though. There’s a nice balance between texture and glitter. It’s also season-appropriate; my nails look like tiny snow-covered driveways. It’s adorable. 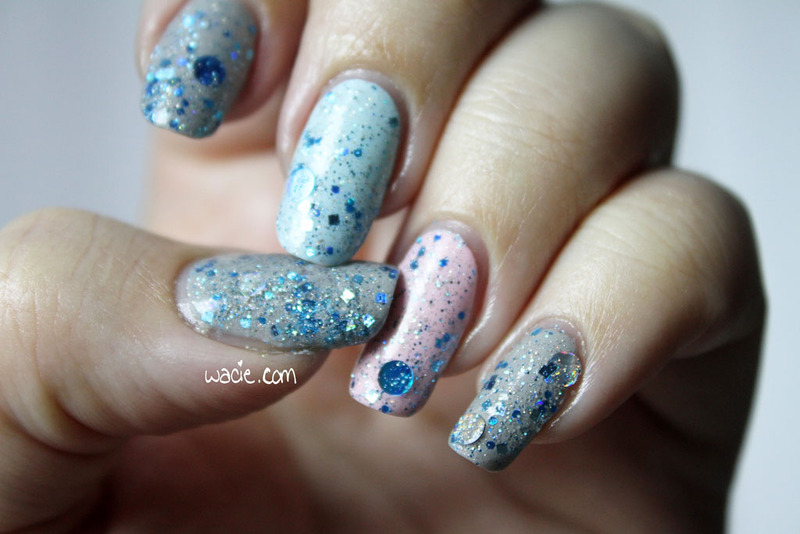 Final word: Solitaire is textured and sparkly, but is still delicate. It’s a perfect match for the cooler temperatures and the upcoming winter season. 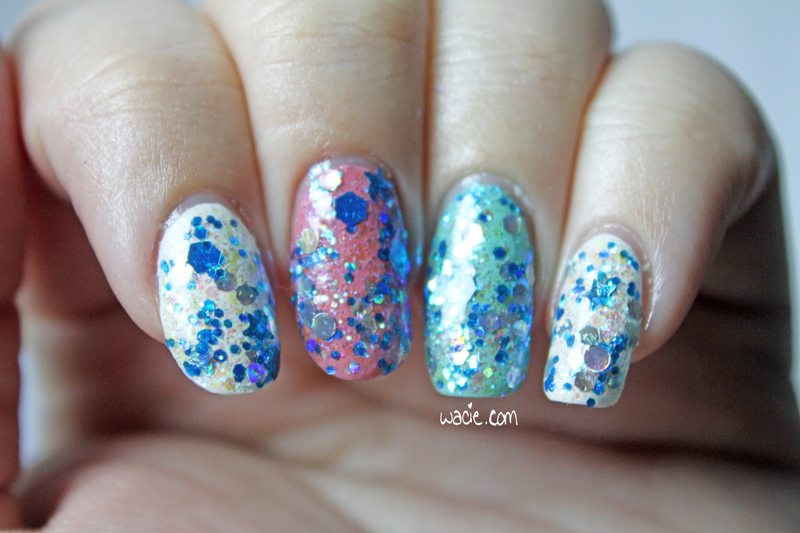 It’s another wintry delight this Swatch Saturday! 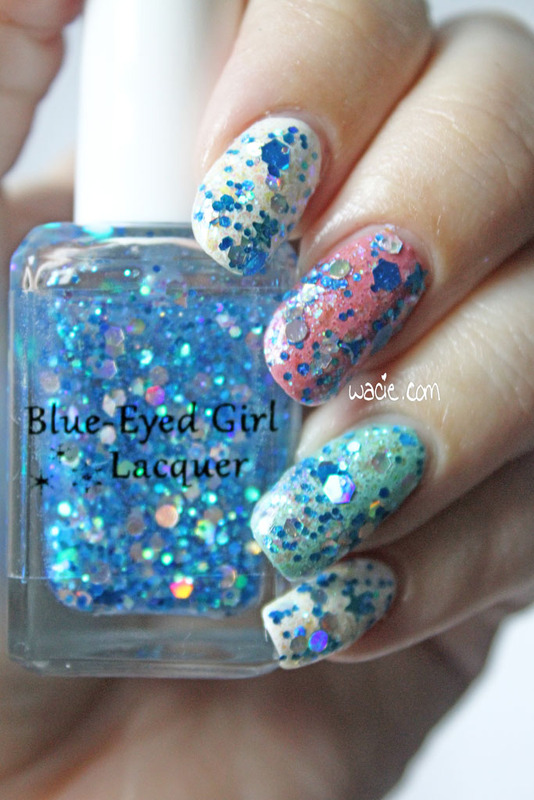 Today we’re looking at the second half of the winter duo Blue-Eyed Girl Lacquer released last year. We saw and loved Untrodden Snow; let’s have a look at Electric Icicle. I’m wearing two coats of Electric Icicle over Sally Hansen’s Hard to Get, Essie’s Marathin, and Julep’s Dianna, as well as one coat of Ciate’s Speed Coat Pro. 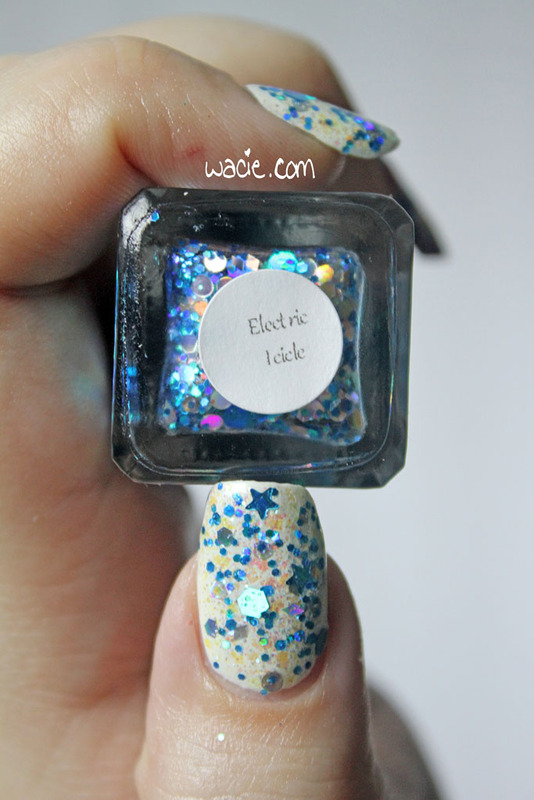 Electric Icicle is a clear glitter topper made with “bright blue holo hexes, rainbow iridecent hexes and squares, silver holo hexes and tiny diamonds, and blue holo stars”. 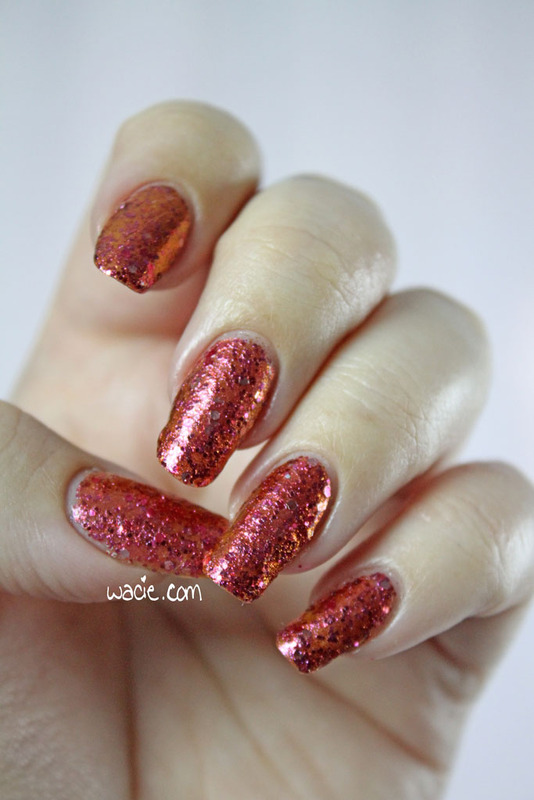 I wore two coats because the all the good shape glitters were hanging around toward the bottom of the bottle, and my first coat was a bit thin on the glitter. 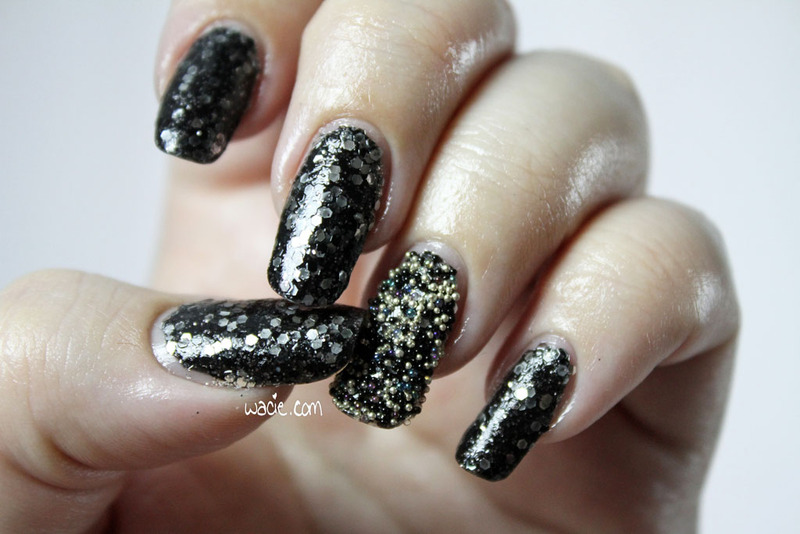 Application was pretty easy apart from that; the glitters spread well and didn’t clump. The base dried quickly. I had no problems with it. I gotta say, this might be the best winter glitter topper I have. 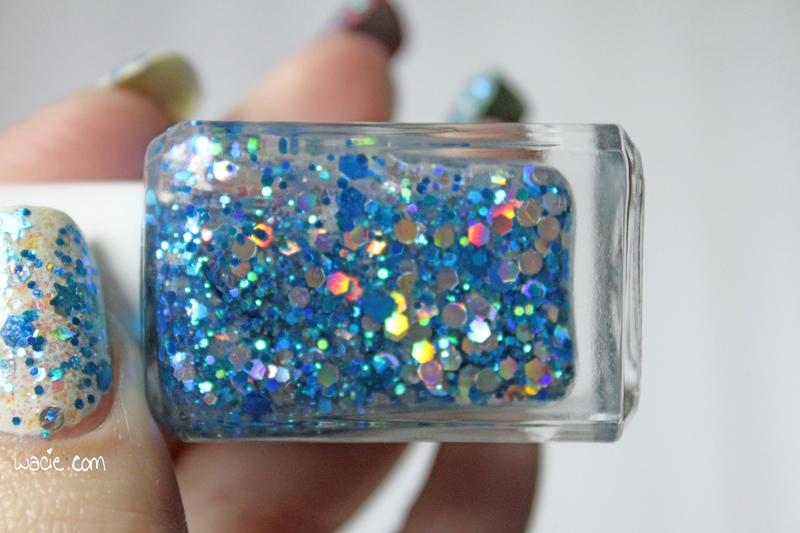 I’ve got a few that have icy blue glitters with silver, and even though they’re very pretty and they shine a great deal, they don’t have a whole lot of color. Electric Icicle is the best of both worlds. 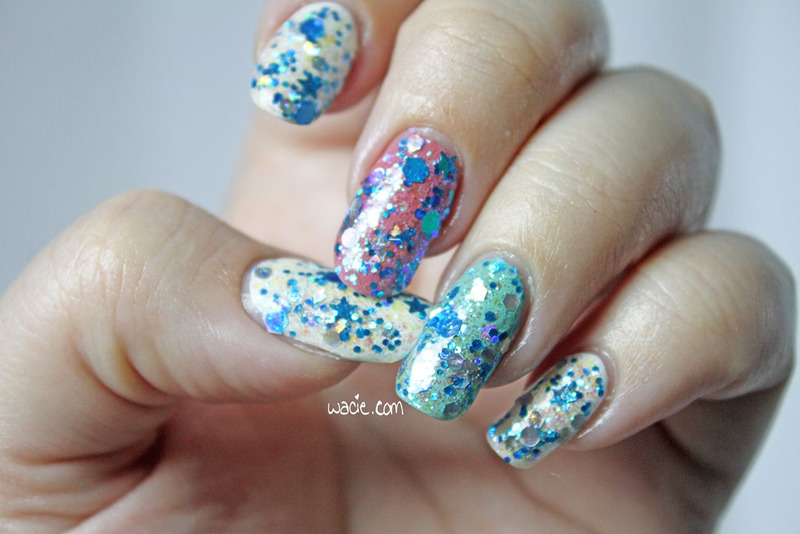 The metallic and holo textures of the glitters — especially the silvers — give the look some iciness, but the blue and iridescent glitters give it a lot of color as well. This is a mix that is all about winter, but doesn’t let winter bring it down. It’s amazing. I nearly swatched this on the pink and blue I used on Wednesday, Mint Candy Apple from Essie and Martha from Julep. They’re really soft but bright colors that make the perfect base for any glitter topper. I was afraid that it would look like the same mani two days in a row, so I went with Marathin from Essie and Dianna from Julep. I chose Dianna because I wanted the blues to be kind of homogeneous, and since Dianna is a dusty color, obviously a dusty rose would complement it. I almost feel like I should have chosen gray over white, but the glitter looks so perfect over white that I’m glad I didn’t. 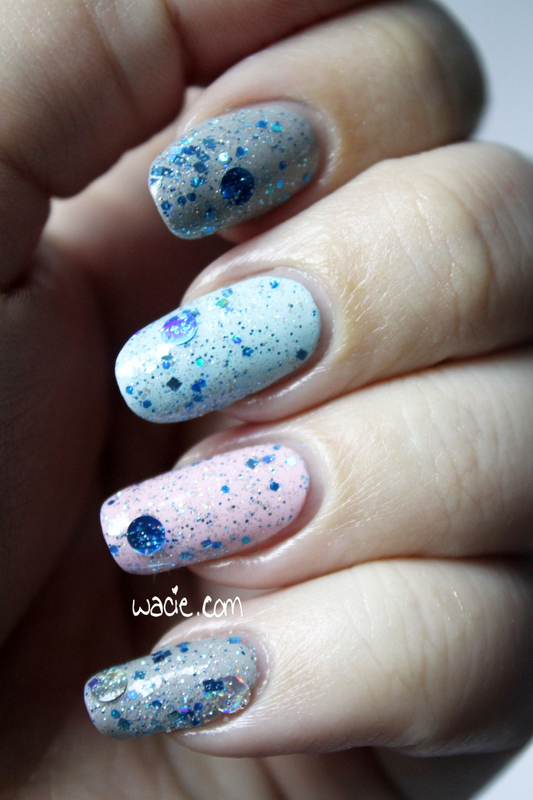 The last Wacie Nail Co. (for now) prototype I’ll be showing you is Wintrella, a glitter topper made up of silver and blue holo glitters. I’m wearing one coat of Wintrella over China Glaze’s Pelican Gray, Essie’s Mint Candy Apple, and Julep’s Martha. 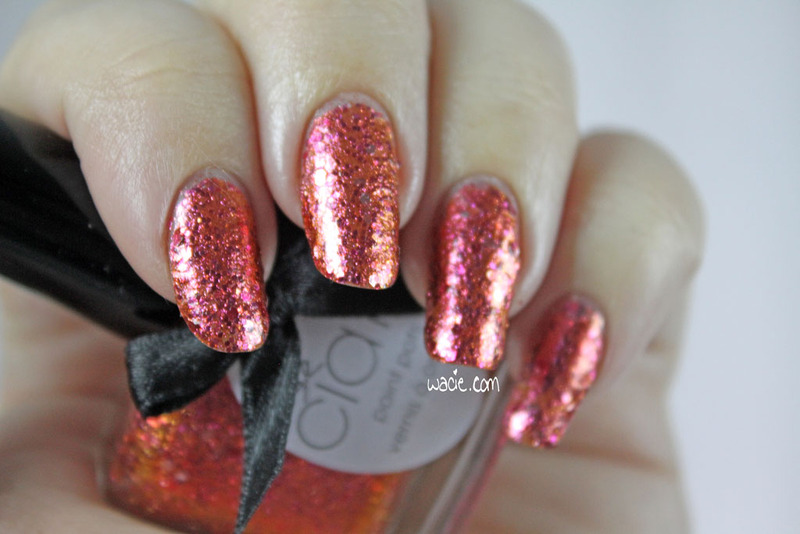 I’m also wearing one coat of Ciate’s Speed Coat Pro top coat. 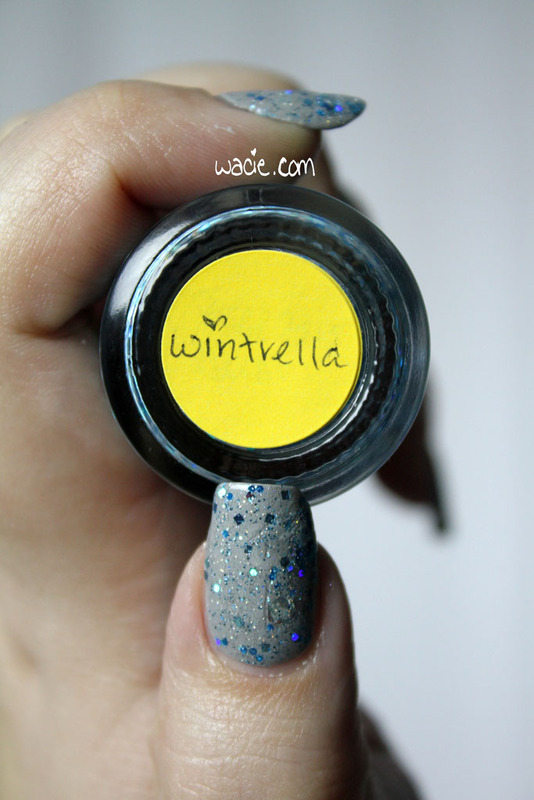 Wintrella has a lot of glitter in it. There’s very fine holo silver dust, tiny hexes, slightly bigger but still somewhat tiny squares, big silver hexes, bigger silver hexes, silver dots, blue dots, and silver hearts, but I couldn’t manage to get those out of the bottle. Again, they just sat in the bottle, mocking me. I couldn’t get too many of the dots, either, but at least I can prove they were in there. Maybe I’m glad I didn’t get so many. 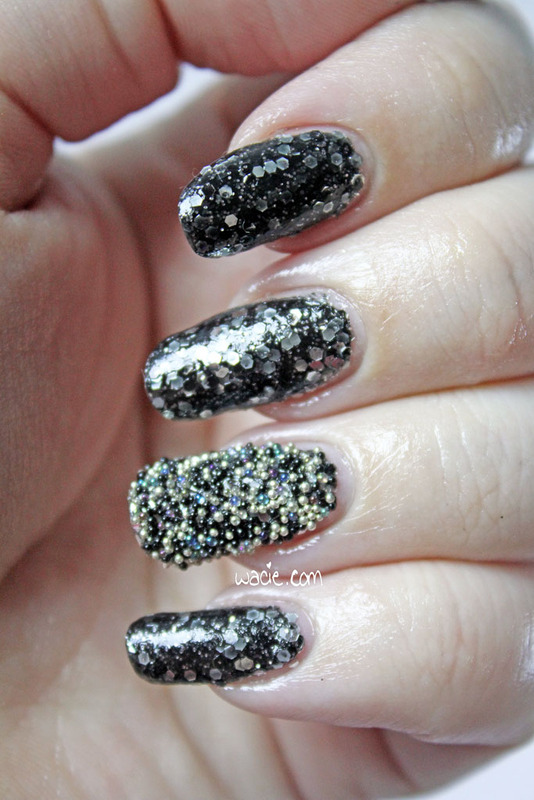 The smaller glitters give a minimal look that’s already quite pretty. The big glitters look out of place. Maybe they’re not right for this mix. Overall, I think it’s nice. I definitely want to take it back to the drawing board, but I think I’m onto something. 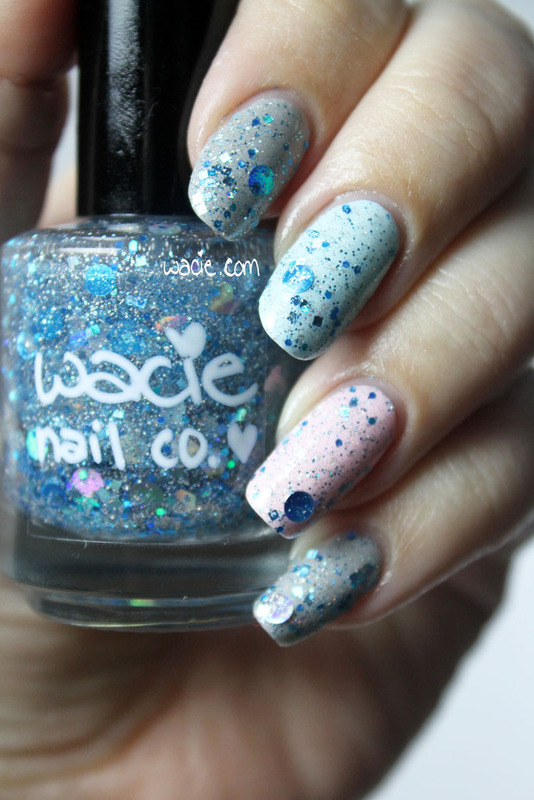 Wacie Nail Company news: I hope to have something in the store before the month ends. I have a couple of limited editions in the works, as well as a New Year’s Eve-themed collection next month. I’m so excited to be working on it, and I hope you’ll like it a lot. It’s the first Manicure Monday of November! I am so happy to be wearing these polishes today. I have on one coat of Digital Nails‘s Multipass over two coats of Essie’s After School Boy Blazer, topped with one coat of Ciate’s Speed Coat Pro top coat. Mul-ti-pass. 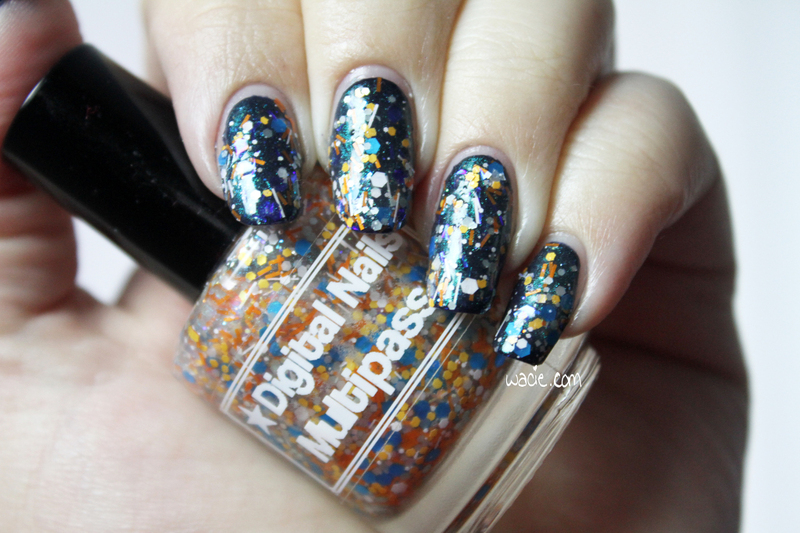 Multipass is a glitter topper based on Leeloo from The Fifth Element. 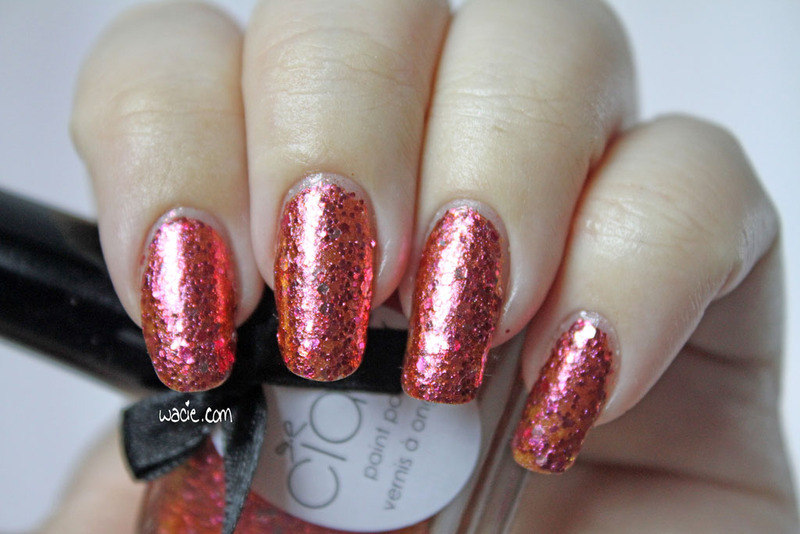 It is described by Digital Nails as “a crazy clown car of color”, and was an attempt to “capture Leeloo’s essence in polish form”. The colors and shapes are evocative of her; blue glitters match her eyes, orange match her hair, white slices to match that weird flimsy bandage outfit she wears in that one scene. 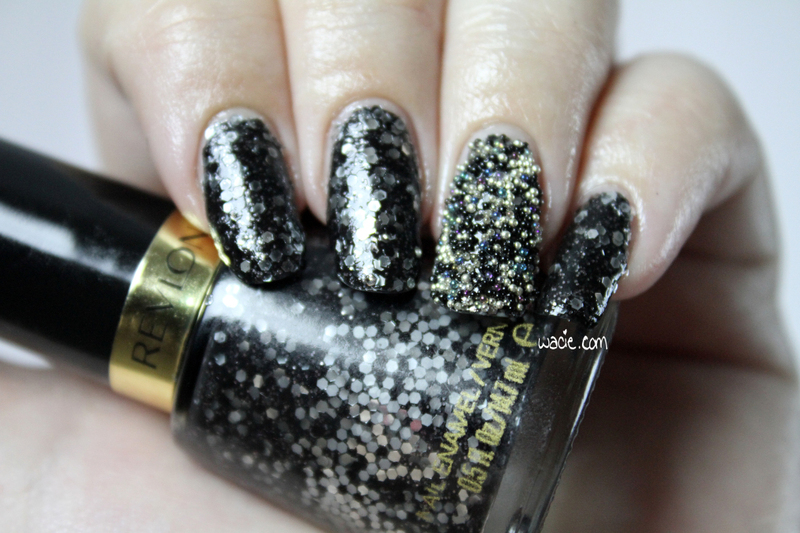 There are also some dark holo glitters and baby shimmers for added sparkle. If you ask me, this is spot-on. Digital Nails really nailed (intended) this one for sure. It couldn’t be closer to perfect. 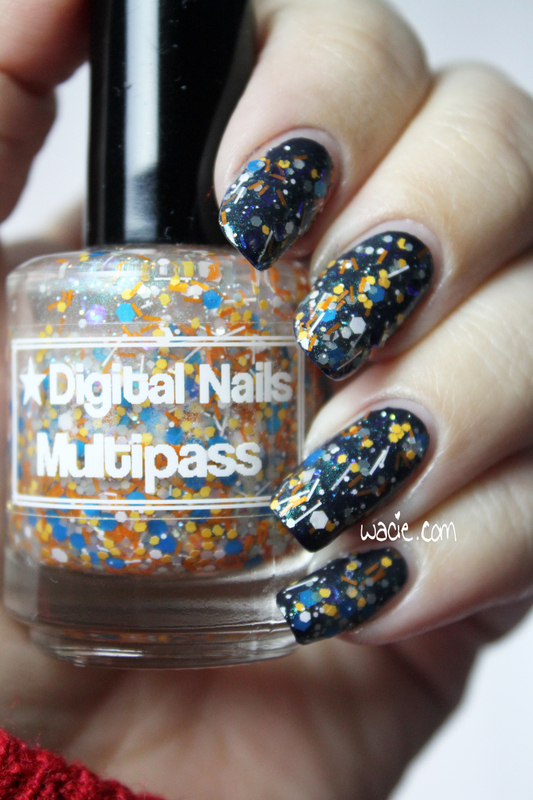 Multipass was very easy to apply and dried quickly. I had no problems at all with glitters refusing to spread or thick, goopy base. It did eat up my top coat; I’ll definitely use something a bit thicker and glitter-friendly next time. A quick word about my base polish: After School Boy Blazer is a deep blue-black creme. Application was easy, the polish dried quickly and with a high gloss. It’s very nice, but it was hard to clean off my cuticles. Maybe I deserve it for not being very careful with it. 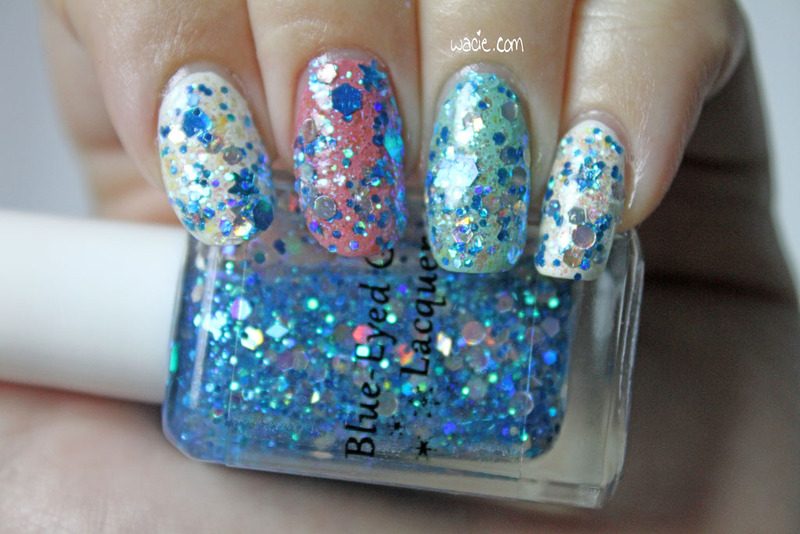 I chose this as the base because it’s the blue that interfered the least with the colorful glitters. Final word: I love this look. I am a huge, huge fan of Digital Nails’s glitter toppers, and I really think they hit this one out of the park.